Havana's historic deep-water harbour and positioning on the north coast of Cuba made it an ideal stop-off for the Spanish. Previously home to the Taino indigenous peoples, the city grew fast in the 1800s through the exporting of various commodities. Tourism reigns today, with hordes visiting the capital's crumbling historical Old Town. The city was founded as early as 1519, after San Cristobal de la Habana was established on the deep-water harbour. The Spanish used it as a stop-off point between the New World and home, removing treasures to Spain. 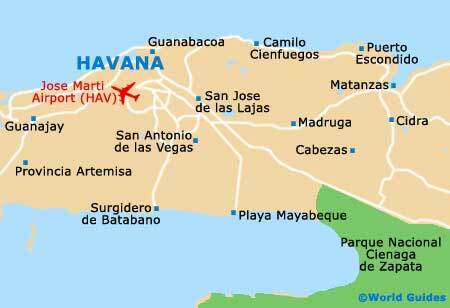 Havana received city status and was crowned capital (from Baracoa) in 1607. The Plaza de Armas in Old Havana hails from around this time, featuring the Royal Force Castle (Castillo de la Real Fuerza) and several other noted landmarks. The first couple of hundred years of Havana history proved slow, as with the rest of Cuba, with the Spanish being more interested in plundering resources, killing the natives and ultimately growing their slave trade. The British came on the scene in 1762, with the Seven Years' War altering the city's course in history and providing a platform for the Spanish to further Cuba's development. History in Havana was especially impressive into the 1800s, with the settlement becoming a busy port city handling massive exports of coffee, rum, sugar and of course, tobacco. Slaves from Africa were used to work the plantations around the city and beyond. Greater prosperity saw Cuban people seeking independence from Spain, culminating in the aptly named Ten Years' War, which began in 1868 and lasted right up until 1878. The 1800s were Cuba's busiest time, and this was especially true for Havana, with Old Havana (west of the harbour) taking shape at this time - today resplendent with plazas, museums, shops, eateries and more than a handful of hotels. Central Park (the Parque Central) also resides within Old Havana, reaching its full scope towards the end of the century. It comes with many colonial buildings, with special features including the Jose Marti statue and the huge Grand Theatre (Gran Teatro de La Habana). Cuba's cigars are known the world over and the original Partagas Cigar Factory (Real Fabrica de Tabacos Partagas) hails from the mid 1800s and resides within the Centro area of the city. The latter part of the 19th century, together with much of the 20th century, were marked down in the history of Havana and Cuba as pivotal on a number of occasions. The USS Maine navy ship mysteriously blew up in Havana's harbour in 1898, sparking the Spanish-American War of the same year and ultimately ending Spanish rule. The defining moment in local history came in the 1950s, when the Revolution, led by Fidel Castro (with Che Guevara), ousted dictator Fulgencio Batista in 1959. Lives were improved by Castro's implementation of the Soviet system, although the US trade embargo and eventual collapse of the Soviet Union (the Special Period) marred prospects for Cubans. Castro resigned as president in 2008, with his brother Raul taking up the post. Today, although there is no more significant aid from Russia, Havana has turned to tourism for revenue, allowing foreigners to develop the hospitality industry. Historical Old Havana is slowly being revamped and attractions like the El Malecon promenade, the Barrio El Vedado (known for its Art Deco look), the ancient Cemetario de Colon and the various harbour forts, all now combine to draw in many tourists.